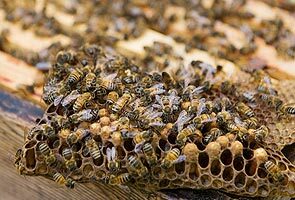 What's especially troubling about this, the researchers pointed out, is that honeybees -- who seemed relatively immune to any negative effects -- are the species usually used to test chemicals. A pair of new studies published Wednesday in Nature are disturbing when taken separately, but so much more chilling when laid out next to each other: The first provides new evidence that neonicotinoid insecticides can have a negative effect on bees, adding weight to the theory that these chemicals could contribute to colony collapse disorder and endanger our food supply. In the second study, another group of researchers found that bees don't avoid these harmful pesticides. They may actually seek them out and get addicted to them. Recent years have seen bee populations on the decline. That's bad news for us, as Whole Foods recently highlighted by removing every product that relies on healthy pollinators from one of their salad bars. While the jury is far from out, some researchers point to neonicotinoids, which have been banned in Britain for two years but are still widely used in the United States, as a potential culprit. These nicotine-related insecticides are favored for their relative safety to humans, because they target specific nerve receptors in invertebrates. But while they're safe for humans in the short term, some studies have argued that they're killing off bees on a scale so large that our food security is threatened. In the first of the two latest studies, researchers tried to determine whether the negative effects seen in bees exposed to neonicotinoids in the lab can be replicated in the real world. Led by Maj Rundlöf of Lund University, researchers used 16 fields planted with Canola -- eight with neonicotinoids and eight without -- across Sweden. They studied colonies of honeybees and bumblebees as well as several individuals from solitary bee species, and they also monitored wild bees living in the area. Honeybees didn't seem badly affected. But bumblebees had slower colony growth rates in the treated fields, and there were fewer wild bees, too. Additionally, none of the solitary females in the treated fields were able to breed as expected, while six of the eight untreated fields saw normal birthing habits. While the study isn't universally damning for the pesticide, it indicates that researchers may not be able to predict how "bees" will react to neonicotinoids using just one species. But maybe bees know to avoid neonicotinoids? Not so, according to Nature's second new study. According to researchers at Newcastle University and Trinity College Dublin, bees are actually attracted to the poison. When presented with a choice between sugar and sugar mixed with the pesticide -- which is bitter, a taste scientists had hoped bees would avoid -- bees didn't show any indication that they could taste a difference. They didn't avoid the pesticide-laced food, and their taste neurons didn't show any difference between the two options. And bumblebees, who seem to have more to lose, were even more likely to eat the pesticides than honeybees. They might even be addicted to the stuff. "Bees can't taste neonicotinoids in their food and therefore do not avoid these pesticides. This is putting them at risk of poisoning when they eat contaminated nectar," lead author Geraldine Wright said in a statement. "Even worse, we now have evidence that bees prefer to eat pesticide-contaminated food. Neonicotinoids target the same mechanisms in the bee brain that are affected by nicotine in the human brain. The fact that bees show a preference for food containing neonicotinoids is troubling as it suggests that like nicotine, neonicotinoids may act like a drug to make foods containing these substances more rewarding. If foraging bees prefer to collect nectar containing neonicotinoids, this could have a knock-on negative impact on whole colonies and on bee populations." And it could be a more common snack for bees than we'd previously thought. In a statement for the Science Media Centre, Linda Field, Head of Biological Chemistry and Crop Protection at Rothamsted Research (who wasn't involved in the study) pointed out that more evidence would be needed to show that neonicotinoids were doing to bees what nicotine does to humans. And she argued that neonicotinoids might still be the lesser of two evils. "We also have to consider the reason why we use these compounds: can we afford not to control pest insects? Is it acceptable that yields would be reduced as a result? Are the alternative insecticides any safer to bees? These are questions that a two-year moratorium on neonics is unable to answer," Field said. But as Britain's two-year moratorium comes up for review this year, the country may be running out of time to come with a definitive answer. And in the United States, the conversation hasn't even truly begun.